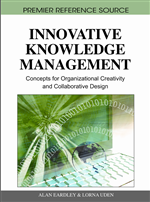 This chapter explores how knowledge management, an enabler of change due to its knowledge creation capability, is subject to several forces that shape its processes and outcomes. A qualitative analysis based on data from a case study of the first major rollout of smartcard technology in France shows how institutional isomorphic pressures affect not only knowledge management processes but also resulting innovations. Government impetus, legal authorities, and cultural expectations in French society produced coercive isomorphic pressures on the credit card industry, while existing credit card solutions, systems, and standards played the role of mimetic pressures, and professional networks and network externalities acted as normative pressures. The study suggests that a systems perspective which acknowledges these institutional isomorphic pressures can lead to greater strategic alignment and can provide a basis for meaningful differentiation and competitive advantage. A prevailing definition of knowledge management is the knowledge value-chain approach common to many KM descriptions (Shin et al., 2001). Magnier-Watanabe and Senoo (2008) for instance describe it as ‘the process for acquiring, storing, diffusing and implementing both tacit and explicit knowledge inside and outside the organization’s boundaries with the purpose of achieving corporate objectives in the most efficient manner’ (p. 22). The four stages of knowledge acquisition, storage, diffusion, and application, although not necessarily sequential, are required to achieve the efficiency function of KM within the organization (Alavi & Leidner, 1999). As such, the two goals of KM are productivity gains through efficient decision-making and problem-solving, and innovation by way of bringing new ideas to market (Holsapple & Joshi, 2000).